Welcome to icon_nomination! 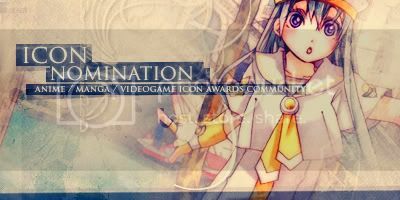 This is a bi-weekly icon nominating community (hence the name) where you can nominate your favorite anime, manga, and video game icons to compete in various categories. In essence, this is a condensed version of ljamia and will be a good place to find awesome icons later on. This community was founded by silverqe and nyaabo after the former noticed there were no nominating communities that encompassed all three media. The latter agreed to help after being bullied into the job. Best Anime Icon: This is the category for the most l33t icon of anime artwork or screencaps. Best Manga Icon: This is the category for the most l33t icon of manga illustrations or panels. Best Videogame Icon: This is the category for the most l33t icon of videogame artwork or screencaps. Best Cropping: The icon with the best use of cropping/image placement. Best Text: The icon with the most aethestically pleasing typography and/or most interesting caption. Best Textless: The best textless (or "hush") icon. Icons in this category may not have any text, including tiny/unreadable text. Best Coloring: The icon with the most eyepleasing use of color, be it coloring that is vivid, faded, duotone, etc. Best Use of Grayscale: The icon with the best use of a black and white color scheme. Icons in this category may have a splash of color, so long as they are predominantly monochrome. Best Use of Resources: The icon that utilizes textures, brushes, etc. in the most effective manner. Most Original: The icon that is the most unique. This is the icon that displays the most daring and un-trendy use of cropping, blending, typography, etc. Best Manga Coloring: The best icon that features a colored panel(s) from a manga. The coloring has to be done by the iconist him/herself, not by someone else. *Special Category: This is a rotating category that will change with every Round at the evil mods' discretion. These categories will often be entirely random and oddly specific. The current Special Category is MOST ANGSTY ICON. Nominations are held on a bi-weekly schedule. Nominations open when results of the last Round are posted (the Special Category will also be announced at this time) and close (obviously) when voting goes up. 1. Hotlinking is allowed in the community for nominating purposes. The icons will be uploaded to a different server during voting, however. 2. The icon makers' names must be posted next to their icon during nominations. Also, if you would like to use any of the icons you see in the community, please give proper credit to the iconists. 3. Icons must be compatible with LJ. They should be 100x100 pixels/40kb or less and in .gif, .jpg., or .png format. 4. Icons must feature official artwork/screenshots from anime, manga or video games ONLY. No fanart, cosplay, doujinshi, or other fanmade work is allowed. 5. You may only nominate the same iconist (up to) three times. 6. You may only nominate the same icon in (up to) two different categories. 7. You may nominate as many icons as you like in one post (keep it reasonable). We encourage you to try and nominate in every category, but it is not required. Voting for nominated icons will open every two weeks on Friday @ 10PM Central Standard Time and close on the following Sunday @ 8PM CST. Results will be posted shortly after voting has closed. Vote in accordance to the outline provided on the voting post. There won't be any prizes for the winners of each Round except l33tness, but silverqe will make you a banner if you want one and ask for it nicely. :) Or, you can visit the lovely custom_banners. If you'd like to exchange links, please comment here. icon_tournament - Our sister community! This is a tournament-based icontest for anime/manga/video game. If you have any questions, comments, concerns, or suggestions, feel free to leave a comment on one of the posts in the community. You may also contact us by email. Original stylesheet by refuted, modified by nyaabo. Headers, banner, and userinfo made by silverqe. Images used are official artwork of Athena Glory, Alice Carroll, and Alicia Florence from the manga ARIA by Amano Kozue. PIMP US AND GET COOKIES. Here is icon_nomination's pimp!banner.